Music and Rhythm - Show Me WOW! 1) sets the rhythm of the school day. 2) watches the mood of the class and responds to it by varying the pace, the activity, the rhythm, to give a wholeness to the activities. 3) instigates a period of calm, when the class has just been excited and very active. No! If they are fidgety, then change to a different learning activity, not a mini indoor P.E.. soldiers drill, which incidentally the more disruptive children will instigate as an avoidance strategy to the continuance of a drudgery lesson when they are bored! Most young children are naturally rhythmic, having lived with the constant rhythm of their mother’s heart beat before birth. Scientists accept that babies in the womb are sensitive to rhythm and music. Caribbean children are outstandingly full of rhythm! They confidently jig on the spot in the supermarket queue and love to dance whenever they have the opportunity. A teacher could easily take advantage of these inherent characteristics in the pursuit of encouraging literacy skills. 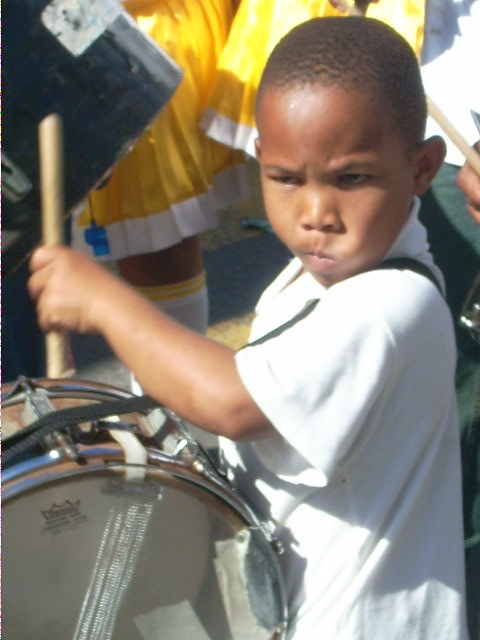 Rhythms make them focus their attention and concentrate, just look at the young man below! encourage and promote literacy skills. Listening to the rhythm of the natural sounds around them, the wind in the mango tree, the rush of the waves crashing on the shore, the rhythm of footsteps approaching the classroom, the rhythm of feet jumping over a skipping rope. Get them to copy the rhythm with a tapping of feet or clapping of hands, or an echoing of the voice. Make it fun! Tapping out the rhythm ( but not saying the words) of a well known rhyme with the children guessing what that rhyme is, encourages listening, by both the tapper and the guesser. Listening to the rhythm of a polysyllabic word encourages children to acquire skills of breaking up the word into its various parts for both decoding and encoding. e.g. plantation, celebration, carnival, passengers. Listening to a teacher emphasising the rhythm of a rhyme, or poem, or song promotes children’s awareness of the rhythms of speech and of reading aloud. Children can then copy the teacher’s intonation, variations in speed and volume. Children love the sound of a gentle rhythmic song or rhyme and find it soothing after an activity that has been exciting or boisterous. Similarly, children who have had a long session of being still, need a lively chant or a busy rhyme or song with actions. Feeling and expressing the rhythm of a piece to be performed in a group, feeling and expressing the rhythm of a speech from Shakespeare all helps. 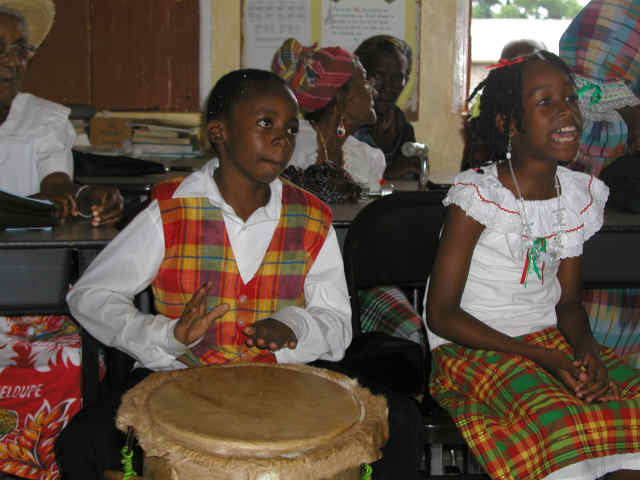 No matter what the age or ability, the rhythm helps pupils to appreciate the musicality of poetry and, if they are learning by rote, like learning Maths tables, the learning process is, for most students, speedier. Good handwriting skills rely a lot on rhythm. Most children adopt good handwriting skills if they have lots of opportunities to draw rhythmic patterns. Patterns invoke rhythm and some patterns rely on rhythm to show consistency. The rhythmic drawing of stripes, of zigzagged lines, of connected circles, of creating a balance of shape and size, promotes a steady handwriting style as well as a keen eye for being able to construct the balance of letter sizes. People learning key board skills often do this to the background rhythm of soft percussion or appropriately paced music. Similarly, children could do the same. Rhythms to encourage the learning of spelling rules. “It works Miss! 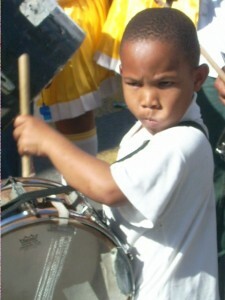 My spelling is much easier to learn if I drum a rhythm to it!” said the drummer boy. 3) “Cross of the Y add I, E, S.” for making the plural form from a singular word ending with y. When teaching the rule for changing country into countries, teach the children to chant. Conduct them by letting them do this on group, the boys, the girls, those to the left of the classroom, those to the right. Make it fun. Later on, the teacher can smile when hearing a child whispering the chant to recall this rule. 4) Rhythmic patterns for specific words like the word accommodate. Think in terms of a hotel booking service. Draw a square box on the chalkboard to represent a single room. Next to it draw a rectangular box to represent a double room, then a square to represent another single room, then another rectangle to represent a double room and finally a square box with an o and another rectangle with the word date in. When chanting, have a visual picture of the word, so that the auditory memory is underpinned by the visual. Get the whole class to chant the rhythm and then the children on one side of the room, followed by the children on the other side. Get them to whisper it, to chant it with a high voice, or a deep one. Make it fun. 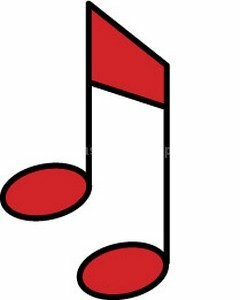 The children could have turns at being the conductor too and a baton could be used to point to the word in a rhythmical way. Activities like this not only make learning to spell certain words fun, but also teach children how to teach themselves how to spell. So many well known chants and rhymes can be acted easily, because the children already know the words! 6,7,8 9 10, then I let him go again. 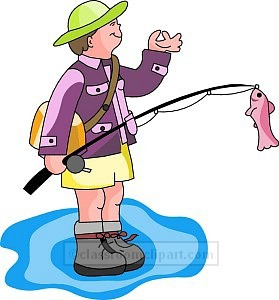 And rhymes and rhythms are ofter easier to learn than straight prose, so a section from a Shakespeare play for older pupils can work in exactly the same way as the fish catching rhyme. On a simpler level, when doing class improvisation in drama, there are often the odd moments when a group is asked to perform to the rest of the class and they start to wobble! But, with the class being in the habit of all rhythmically saying. “One, two three go” at times like this, the actors will lose the wobble and will feel less alone, knowing that the rest of the class is encouraging them on. I think that many learners do not like to work in silence and once out in the workplace, many will find that they are having to work in a less than silent atmosphere. Playing the right kind of music in the classroom goes some way to addressing some of these issues. Set the mood of the class so that the pupils are ready to listen. Pupils might close their eyes, or look at an abstract picture or the movement of trees outside,or might scribble on scrap paper. As long as whatever they are doing maintains the atmosphere for them and for the others, all these activities should be accepted and encouraged. Music can be taken in its broadest sense, traditional music or the sound of the ocean, the sound of whales, the sound of a rain forest. The quality of the listening is paramount. Whilst listening, pupils might jot down or draw ideas and images. The music should be played whilst the pupils write and should be played when they read back to the class. Once the habit is set, other lessons follow even more successfully. By modeling good practice, encourage children to feel the rhythm of reading and to enjoy the music of the read aloud word. This encourages them to match the rhythm they produce with the story line, in a different level to the way they do this in other circumstances and in one of the most effective ways of tackling comprehension. They listen to the tone of their voices, vary the speed, orchestrate the words to communicate the text. Comprehension is far easier to tackle if the pupil can enjoy, through the rhythm of the language, the vision of the literature…. and it’s more fun too! One little 5 year old girl was noticed happily lost in the Book Nook, not reading allowed but singing the words as she read them. She was having a lovely time, lost in the story! The teacher should always model a well read passage, including its highs and lows, its crescendos, its different sounds for different characters’ voices. creating different texts to practice the rhythms of reading a news flash, commentating on a cricket match, interviewing people on a carnival float. 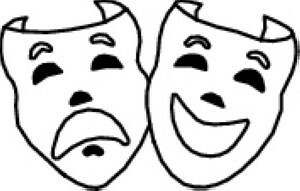 inviting actors into school to talk about the different ways they use their voices and their sense of rhythm to create characters and atmosphere. Above all, enjoy the rhythm and musicality of promoting literacy by making it fun for you and for them. Addendum And this technique I saw in a Florida school…the recorder class had many children interested in judo and the coloured belts that showed promotion in that sport. The teacher had small piles of cut wool in those colours and, as each child progressed from playing a simple piece to the next level and so on, they were awarded a small piece of coloured wool to tie on their recorder to show their promotion in that skill. Wow! They loved this encouraging and not costly technique.